A isn't a boy or a girl, doesn't even have a body. Every day, A wakes up as someone else, lives as that person for a day - trying not to alter their life too much - before then moving on and becoming someone else for the next day. (We first meet A as a boy and for simplicity, I'm just going to use male pronouns.) A doesn't know why his life is different from everyone else's and doesn't try to control it or build relationships with anyone and is always careful not to leave a trace of his presence. Until he meets Rhiannon, and then everything changes. When I first heard about this book, I thought the premise was dubious, but as I read I became fascinated by this idea. A had experienced so many different kinds of people that he understood a lot more than most people do. He had been chronically ill, blind, a drug addict, rich, spoiled, everything you can think of. It gave him insights into human nature that nobody else can really have, especially at so young an age when most teens' experiences have been quite limited. Despite these insights, it's also true that he was never any of these things for more than a day. That also means he had never been anyone's child, sibling or friend for more than a day. Tomorrow meant nothing because tomorrow he would be somewhere and someone else. He realizes at one point that nobody has memories of his childhood, he'll never have anyone to grieve for him, or to remember him when he's gone. It's a bit mind-blowing if you think about it. Convenient to the plot, A was always in the US, pretty much confined to one part of the country. This made it easy to further the plot by being able to hunt down Rhiannon pretty easily, but was a bit disappointing. I would have loved seeing him try to adjust to other cultures around the world. I found his experience as a body-hopper much more interesting than the romance that was supposed to be central to the novel. I'm all for a good romance, but can't even buy someone falling in love with someone from spending an afternoon together and then not being able to let go, risking everything to be with them again. The ending also left me unsatisfied, but I'll leave it at that so as not to spoil anything. Other readers obviously feel differently about the romance and the ending based on their reviews. Still, I'm glad I read it. Although I didn't love it madly as some do, it was imaginative and gave me a lot to think about. 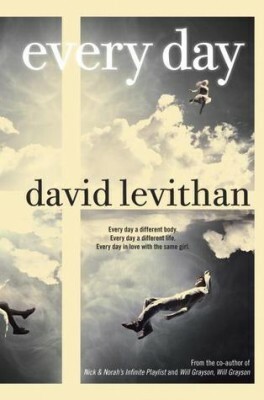 I like David Levithan's writing style and will certainly read more of his books in the future.